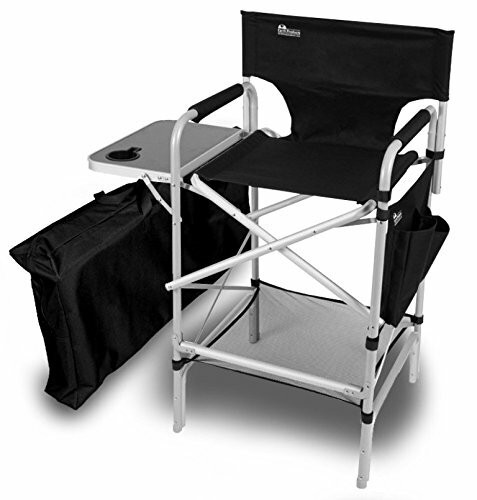 Having a heavy duty camping directors chair is a great investment for camping, tailgating or sitting out in the backyard. You can get them in different weight capacities if you need one for over 250 pounds, 300 or 500 pounds. The directors chair style also comes in an option of regular height or tall height. You want it to be easy to fold and unfold – sound silly but I bought a chair that is a nightmare to fold up!! Do you want a cup holder? Do you want a side table to put your food or drinks on? Ozark “Big Boy” chair is one of the best folding directors chairs on the market today. It has a weight capacity of 600 pounds. This support is provided by a steel frame and extra wide seat. The seat is 42 inches wide which makes it extremely comfortable to sit in and also makes it easier to get in and out of the chair. Nice added features are the extra padding on the seat, a folding side table with cup holder. The only down side to this chair is that it is heavier to carry than other chairs on the market. The heaviness is due to the steel frame and the larger seat. Ozark also offers a 500 capacity chair with the same extra wide seat of 42 inches. This chair also comes with a folding side table and cup holder. You can read customer reviews on Amazon here. Earth Executive VIP Tall Directors ChairIt’s hard to see in the picture, but this chair has 8 points of contact on the ground instead of the traditional four. This provides better stability when getting in and out of the chair – a really nice benefit. Many of the people who reviewed this chair are makeup artists who like the height of the chair and the durability. It’s great for camping if this is the height you are looking for. Holds a weight capacity of 375 pounds. Has an anodized aluminum frame. Large side table with cub holder. Full-width foot rest and padded arm rests. Read reviews on Amazon here. The Tailgaterz is a tall chair where the seat is 24 inches off of the ground (so not as tall as the Earth Executive above). It is built with a steel frame and will support a weight capacity of 350 pounds. In addition to the folding side table and cup holder, it also has a fold-away foot rest for added comfort. This folks have also provided extra padding on the seat which can be removed if you want to use the padding as a stadium cushion. Read Tailgaterz reviews on Amazon here. The Stylish Products chai r is lightweight as it has an aluminum frame and is easy to carry around. This is a regular height camping chair with the seat about 18 inches off of the ground. It has a weight capacity of 350 pounds. It offers a folding side table with cup holder for added convenience. Reviews on Amazon are quite mixed. Some love the chair and others hate it. You can read the reviews here. If you are looking for something that is more lightweight to carry and not so heavy duty, then you might want to consider the following brands. Reviews have been pretty good and the links will direct you to their best capacity chairs.